TATAMAGOUCHE, NS–Walking through the streets of Guatemala City, HIJOS slogans are hard to miss: "Justice for Nueva Linda"; "Trial and Punishment for Military Assassins!" Words demanding an end to impunity remind everyone that 36 years of civil war in Guatemala have not ended in justice or peace. HIJOS Guatemala—Sons and Daughters for Identity and Justice Against Forgetting and Silence—was founded in 1999 by young people who were forced into exile, or who lost family members due to State repression during the war. (The group's name, HIJOS, is a play on the Spanish word for "children.") 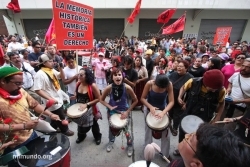 In June 2009, HIJOS Guatemala celebrated 10 years of fighting to preserve historical memory, to end impunity, to memorialize the victims of the war, and to shed light on the human rights violations committed during the conflict. Using public education events, protests, and political art and murals to articulate and strengthen the movement toward justice, HIJOS is comprised of students, workers and professionals of Ladinos (Guatemalans of mixed Hispanic and Indigenous origin) and Indigenous descent. A new generation of HIJOS is now being born as those who started the group 10 years ago pass on to their hijos the struggle of those before them. HIJOS members—including children of the disappeared and murdered, and Guatemalans who stand in solidarity with the group—work in rural communities as well as in the urban centre of Guatemala City. While many group members hold "day jobs" with other human rights and social justice organizations, they are more than simply volunteers for HIJOS; for many, HIJOS is a way of life, an extended family. HIJOS not only focuses on justice for past crimes, but also draws attention to new threats Guatemalans face today. In a recent bulletin, HIJOS stated: "According to our interpretation of the history and the memory of the resistance of the People, we understand justice to be a historical demand of the grassroots struggle for dignity, sovereignty and self-determination." Bety Reyes Toledo knows HIJOS well. Reyes Toledo is the daughter of Hector Reyes, a Guatemalan peasant who, after trying to organize workers and obtaining evidence of back-door dealings involving the owners of the Nueva Linda plantation where he worked, was kidnapped and disappeared on September 5, 2003. Reyes Toledo, her family, and over 170 other families have been camped on the side of the road outside the plantation since 2004, demanding justice and information on the whereabouts of her father. "HIJOS has been with us throughout our struggle and because of them, more people have become involved. They help give us the strength to go on because we feel supported," said Reyes Toledo. HIJOS, in collaboration with other social justice organizations, has arranged food and clothing drives, the "Caravan for Justice" on the anniversary of the disappearance of Hector Reyes and protests to support justice for the Reyes family and all families and workers at Nueva Linda. But not everyone is happy with HIJOS’ call for an end to impunity. The group has experienced threats and acts of intimidation, including office break-ins and an attempted kidnapping. Members of HIJOS have been victims of political campaigns and attacked through the Guatemalan media. 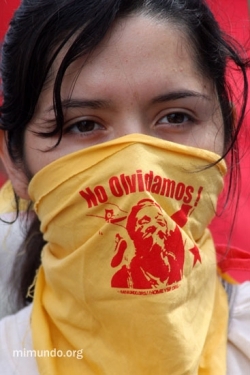 According to a June 2008 "Urgent Action" (a call to action sent to HIJOS' national and international solidarity networks), one member was followed, beaten up on the street and warned to tell others to back off a public demilitarization campaign that involved HIJOS and 15 other organizations, or suffer the consequences. The group continued its work and 2008 marked the first year the military parade was suspended from its annual June 30 march through Guatemala’s historic centre. "For HIJOS Guatemala, who have been going out into the streets...to point out [and] to reject the criminal presence of the army and its high command which acts in total impunity, the suspension of the parade is a victory that has been won thanks to the people who year after year have marched in light of threats, attacks and repression," said Wendy Mendez, a human rights defender and co-founder of HIJOS Guatemala. In fact, HIJOS' June 30 anniversary falls on the same day as Guatemala's annual military parade—a day now known, thanks to the efforts of HIJOS and others, as the "Day of Heroes and Martyrs." "Along the way we have learned that the struggle for memory, truth and justice in Guatemala is a long and historical process for the survivors of genocide, therefore it has many actions, strategies and chapters that must be written in order for those democratic principles to become a reality." Mendez said that stopping the Military March was one such action on the road to democracy and peace. Born in Guatemala, Mendez and her family fled to Vancouver, B.C., after witnessing the forced disappearance of her mother, Luz Haydee Mendez, by the Guatemalan Military Intelligence on March 8, 1984. Following its investigation between April 1997 and February 1999, the United Nations Commission for Historical Clarification (CEH)—a commission created through the peace negotiations and the Accord of Oslo in 1994—reported that state forces and related paramilitary groups were responsible for 93 per cent of the violations documented by the CEH, including 92 per cent of arbitrary executions and 91 per cent of forced disappearances. Victims included men, women and children of all social strata: workers, professionals, church members, politicians, peasants, students and academics; in ethnic terms, 80 per cent were Indigenous Maya. During the 36-year conflict, the CEH reported that over 200,000 men and women were killed or disappeared. Forced disappearance is a war tactic used to systematically terrorize a population. 626 villages were completely destroyed, 1.5 million people were displaced by the violence, and more than 150,000 were driven to seek refuge in Mexico. Ten years after the release of the report, the numbers are estimated to be higher still as clandestine graves continue to be exhumed and those once unwilling to talk about la violencia have begun to open up and tell their stories. To date, however, none of the intellectual authors of the war—including military high command and civilians in power during the violence in the early 1980s—have been tried, let alone convicted. The recent presentation of the Guatemalan Presidential Peace Secretariat’s "Report on the Authenticity of the Military Diary" verified facts found in a military dossier detailing crimes committed by the military during the civil war. The dossier was smuggled from Guatemalan military intelligence files in 1999. Given the release of historical documents from the national policy archive that affirm these details, Mendez is disappointed with the Guatemalan government's unwillingness to act on its own findings. She reiterated the sentiment of those who continue to struggle for justice: "We do not need another study into the authenticity of the facts. We need a judicial investigation, trial and punishment for those responsible." It has been 13 years since the state and the URNG (Guatemalan National Revolutionary Unity) signed the Peace Accords for “true and lasting peace.” However, structures of exclusion, antagonism and conflict continue to oppress the majority of Guatemalans who suffer at the hands of an unwieldy and corrupt National Civil Police force, a so-called social democrat government with a neo-liberal trade agenda, corruption and weak state institutions. Above all, the power of the highly trained Guatemalan military continues to seep into and thus control all levels of Guatemalan society, provoking instability and fear throughout the country. Mendez reflects upon the disturbing trend of increased violence in Guatemala: "At first we were certain that the wall of impunity would come down with the fulfillment of the Peace Treaties signed in 1996, but since these have not been respected by any of the governments since, and on top of that, the Free Trade Agreements' agenda and policies have been imposed, the reasons that gave origin to the war are still present and the levels of impunity and corruption have grown." As crime levels surpass those reported during the war—of which 99 per cent go unpunished—and drug cartels control borders and entire communities, the military continues to move freely into rural communities. These are the same Indigenous communities wherein not long ago the state orchestrated massacres. The low-paid National Civil Police provide little civil security for Guatemalans, and in many cases they are not trusted due to their associations with the mafia. Practices include demanding bribery payments, brutal treatment of civilians and general abuse of power. In its desperation to reduce the high levels of crime, the population is turning to the military for protection. On the other hand, thanks to a beefed-up military budget, military bases have been reopened and new ones have been created. In communities fighting to save their natural resources from transnational mega-projects, such as mines and dams that threaten to destroy the land and displace thousands of Indigenous people, the newly created "combined forces"—police-military patrols—are stationed to remind citizens that their moves are being watched and reported upon. Mendez reflects on the work and struggle to which HIJOS has committed. "On our 10th anniversary, we confirm that the best way to bring honour and glory to our mothers and fathers, to all the victims of genocide in Guatemala, is to continue the struggle for social justice and democracy." Jackie McVicar works with the Maritimes-Guatemala Breaking the Silence Network (BTS) in Guatemala City. BTS has been supporting and collaborating with HIJOS initiatives for nine years. Submitted by Riggs on Thu, 2009-07-16 05:39. Submitted by Anonymous (not verified) on Wed, 2011-05-18 15:41. It is very sad indeed. I hope to one day say that crimes against humanity and basic civil rights aren't in existence, until than we'll hope for a better day.